Camp Benjamin Hawkins is named in honor of a respected U. S. Army officer and U. S. Senator who played a significant role in the settlement of the City of Macon. Camp Benjamin Hawkins, a 500-acre camp located just 20 minutes from downtown Macon near Byron, Georgia offers a wide variety of exciting programs for new and advanced campers. 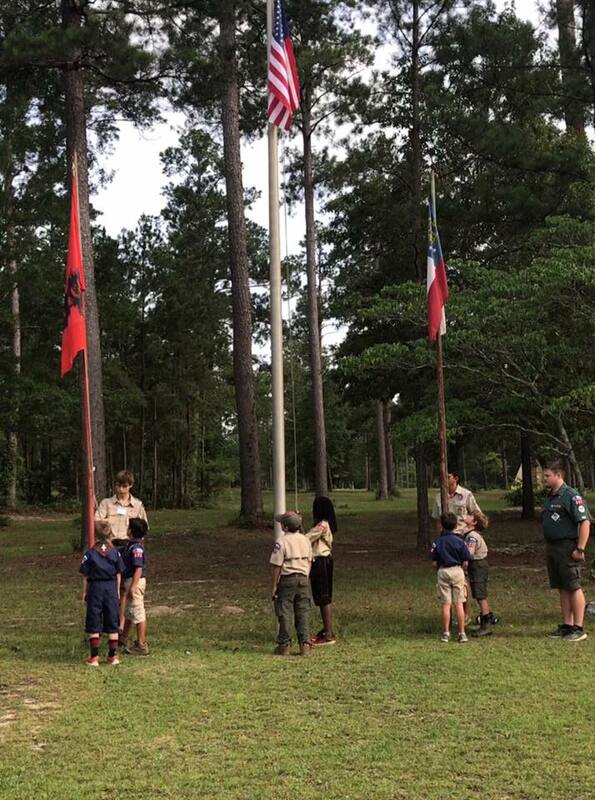 Used year-round by Cub Scouts, Boy Scouts, Venturers, and Explorers, Camp Benjamin Hawkins is a popular retreat for Cub Scout family campouts, camporees, training courses, day camps and other events. When you visit, you’ll see why. Thanks to a successful capital campaign, over $1 million in capital improvements have been completed over the past decade or so. New facilities include an expanded 300 seat chow hall with two new decks and a Scouters’ lounge, new freezers, water system and electrical enhancements, 14 new program shelters, and a renovated trading post with bathroom facilities. Also, we purchased a nearly new camp truck and new lawn maintenance equipment, and we built an archery deck, shotgun and black powder range. A 1,200 square foot multi-purpose shelter, a 300 seat amphitheater, renovated A-frame showers with adult male, female and youth privacy, and a pedestrian bridge across Juniper Creek have also been completed. Did we mention new shooting sports equipment, whitewater canoes, climbing gear, tents and platforms and three new handicapped accessible Adirondack shelters? Now, we hope you’ll want to see more. Praised by many Scoutmasters for its pristine, natural setting, CBH offers what many youth camps are abandoning -- a great outdoor, camping experience that gets boys back to nature and away from city life. Want to know more? Contact us at 478-743-9386. Camp Benjamin Hawkins has reached a pivotal point in its ability to offer summer camp operations. Due to housing growth adjacent to CBH, landfill issues, advances in technology (Internet to discover other camps), new regulations, evolving demographics, fresh interests and needs of Scouting’s youth and adults and a desire for a more pleasant climate, interest in summer camp at CBH has shown a steady decline. Based upon pre-registration, the camping committee recommended that the two weeks of summer camp in 2006 not operate. In turn, the executive committee concurred with the recommendation and voted to cease 2006 summer camp operations. At a regularly scheduled board meeting on January 19, 2006, the executive board ratified the decision of the executive committee. Therefore, the two weeks of summer camp will not operate at CBH in 2006. Every camp is competing for youths’ time and interests, not only with other BSA camps, but also with other youth serving organizations and commercial companies. Over the past decade troops have become more mobile and some troops through product sales have earned enough funds to visit Alaska, Northern Tier High Adventure Base (Canadian Border), Florida Sea Base (Florida Keys), Philmont (New Mexico) and other council high adventure camps. In spite of declining attendance at CBH, long-term camping in the council remains very strong, evidenced by record numbers of Eagle Scouts in 2005. The council camping committee is helping troops locate available summer camps and is providing Scoutmasters with contact information and leaders’ guides through roundtables and commissioner staffs. Further, the camping committee will explore the future usage of CBH for 2007 and beyond. Rest assured, there’s no effort afoot to sell or close Camp Benjamin Hawkins. CBH will continue to be used year-round for camporee(s), day camp(s), weekend troop camping, fall family festival(s), Cub Scout family camping, and non-BSA usage. In fact, approximately 2,500 year-round campers/guests visit CBH annually. Again, the executive board’s decision affects only the two weeks of summer camp in 2006. If your troop needs further assistance with locating available camps, please contact the council service center at 478-743-9386.